Former secretary of education Ron Tomalis warned a member of Gov. Tom Corbett’s staff that a subpoena to testify in a Sandusky investigation was on its way, according to a newly released e-mail. The April 25, 2012 note to Jennifer Branstetter, the governor’s director of planning an policy, appears to have been sent after Tomalis or the education department received a separate order to produce information or testimony. “I would expect something your way too,” he told her. It’s unclear which agency was doling out subpoenas to state officials, but two investigations were ongoing at the time. 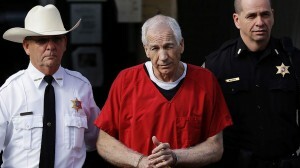 Penn State released a copy of a February 2012 subpoena from the U.S. Attorney for the Middle District of Pennsylvania, which asked for the names of all trustees since 1998. And Attorney General Linda Kelly, who was appointed by Corbett after he was elected governor, was also continuing to investigate aspects of the Sandusky matter. The education department said last week that it couldn’t find the subpoena discussed by Tomalis and general counsel Joseph Miller in the e-mail. Tomalis, who resigned as secretary of education a year ago, was the only person who might have a copy of it, according to department officials, and Tomalis said he couldn’t find one. It doesn’t appear that officials checked with their own legal office, however.